Python Koans is a port of Edgecase's "Ruby Koans" which can be found at http://rubykoans.com/. Either site will allow you to download the source as a zip/gz/bz2. 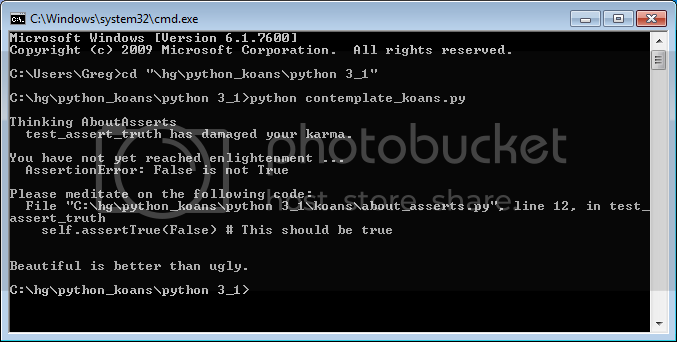 Aside from downloading or checking out the latest version of Python Koans, you need to install the Python interpreter. You should be able to work with newer Python versions, but older ones will likely give you problems. After installing Python make sure the folder containing the python executable is in the system path. In other words, you need to be able to be able to run Python from a command console. With Python 2 it will be called python or python.exe depending on the operating system. For Python 3 it will either be python3 or for windows it will be python.exe . It also tells me exactly where the problem in, its an assert on line 12 of .\koans\about_asserts.py. This one is easy, just change False to True to make the test pass. The Python Koans is a made up of about 2/3 Ruby Koans ported material and 1/3 Python specific tests. The content ported from Ruby Koans includes all the assignment projects. Content for Python 3 is a little different to the Python 2 flavor due to big changes between the two different versions of the language. For example, in the Python 2 variant the differences between old and new style classes are covered. This loses relevance in in the Python 3 version, but there are some extra tests covering new functionality. There are number of other great Koan projects out there for various languages and frameworks. Most of them can be found in github. Also there is a little koans activity on bitbucket. 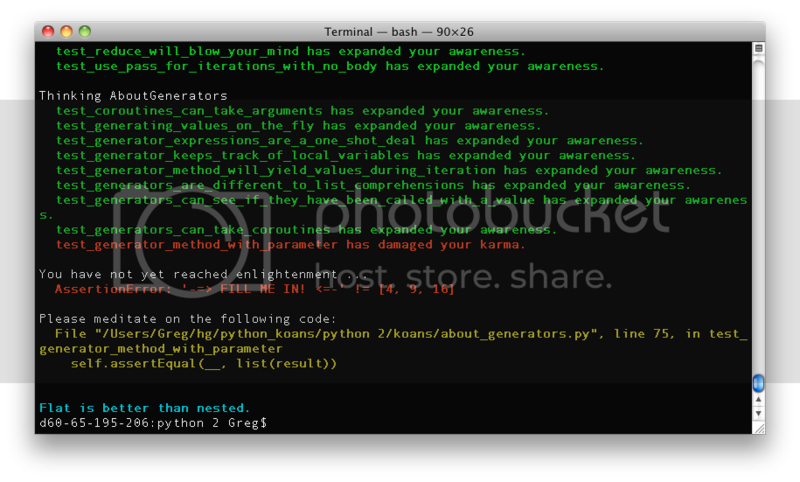 Thanks go to Jim Weirich and Joe O'Brien for the original Ruby Koans that the Python Koans is based on! Also the Ruby Koans in turn borrows from Metakoans so thanks also go to Ara Howard for that!